In recent years, several scientific investigations have reported the therapeutic implications of superoxide dismutase (SOD) against oxidative stress and -induced pathology in clinical and preclinical trials. Indeed, various kinase, molecular signaling and physiological process has altered by reactive oxygen species. In spite of the abundant available literature reports, patents, clinical trials and commercialized products, the therapeutic application of SOD as a potential drug still remains unclear. 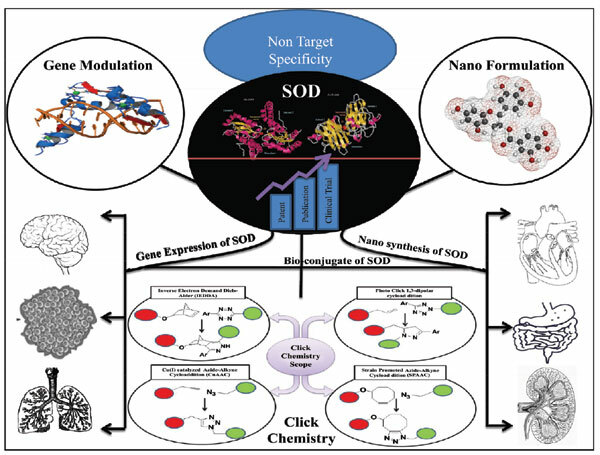 Owing to the technical challenges associated with the utilization of SOD as a drug, we revisited the structural arrangement and cellular signaling, significant association with kinase, exploring the new target sites and introducing new formulation strategies such as gene modulation, nano-formulations and click chemistry is a prerequisite. In-addition to gene modulation strategies, encapsulated formulation within a nano-carrier for producing promising SOD therapeutic effects, application of click chemistry including bioconjugation and cyclo-addition are the most prominent methods to produce highly efficient SOD formulations. Thus, the present review enlightens the foremost technique which may have better interaction with kinase and other cellular signaling for regulating the physiological process. Keywords: Superoxide dismutase, kinase, oxidative stress, click chemistry, gene modulation, nano-formulation. Keywords:Superoxide dismutase, kinase, oxidative stress, click chemistry, gene modulation, nano-formulation. Abstract:In recent years, several scientific investigations have reported the therapeutic implications of superoxide dismutase (SOD) against oxidative stress and -induced pathology in clinical and preclinical trials. Indeed, various kinase, molecular signaling and physiological process has altered by reactive oxygen species. In spite of the abundant available literature reports, patents, clinical trials and commercialized products, the therapeutic application of SOD as a potential drug still remains unclear. Owing to the technical challenges associated with the utilization of SOD as a drug, we revisited the structural arrangement and cellular signaling, significant association with kinase, exploring the new target sites and introducing new formulation strategies such as gene modulation, nano-formulations and click chemistry is a prerequisite. In-addition to gene modulation strategies, encapsulated formulation within a nano-carrier for producing promising SOD therapeutic effects, application of click chemistry including bioconjugation and cyclo-addition are the most prominent methods to produce highly efficient SOD formulations. Thus, the present review enlightens the foremost technique which may have better interaction with kinase and other cellular signaling for regulating the physiological process.